GARDEN GROVE HIGH ran past La Quinta 47-28 Thursday night to win a fifth straight Garden Grove League varsity football title (OC Tribune photo). Garden Grove High put away a stubborn La Quinta team Thursday night to win yet another Garden Grove League varsity football title. The Argonauts (8-2) jumped out to a 21-0 early lead and slugged it out with the Aztecs (7-3) the rest of the way to prevail 47-28 at the Grove field. It was the Argonauts’ fifth straight GGL title, and the eighth crown in nine years. 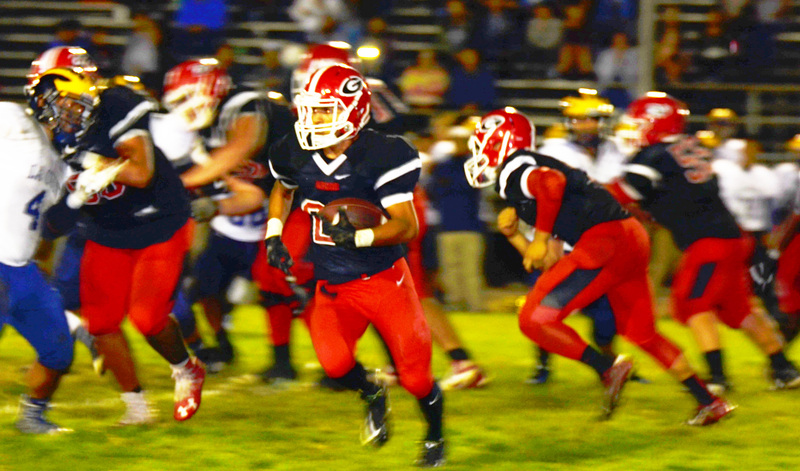 Grove now heads into CIF-SS Division 8 playoffs, where Coach Ricardo Cepeda has high hopes for his team. “Our goal is always the CIF title,” he said. “We went to the semifinals last year, and have been in the finals five of the last eight years.” Quarterback Ruben Mendoza was again the spark plug for the Argonauts. The 5-10 senior passed for 128 yards and rushed for 130 more. LQ’s Dylan Do ran for 104 yards. La Quinta may advance to CIF–SS Division 13 action as well. The pairings will be announced on Sunday. In other area prep football action Thursday night, Pacifica grabbed third place in the Empire League with a 48-14 win over Kennedy High at Bolsa Grande Stadium. The Mariners finished their 2016 regular season at 6-4 overall and 3-2 in league and will likely make the post-season tournament in Division 10. Pacifica was led by Ben Jefferson, who threw for four touchdowns and 172 yards, and ran for 109 more yards and another score. Also, Orange beat Loara 50-9 in their Golden West League finale. The Panthers at 7-3 overall and 2-3 in league, but one of their losses was by forfeit for using an ineligible player. Against Loara, Miguel Brendan ran for three touchdowns, totaling 119 yards rushing and passed for 145 yards. In the Sunset League, Marina escaped the cellar with a 35-7 win over Fountain Valley at Westminster High. Ian Green passed for 186 yards and three scores in the win. The Vikings finish the season 4-6 overall and 1-4 in league while the Barons went to 1-9 and 0-5. It was Marina’s first Sunset League victory after 60 losses. Three area girls’ volleyball teams won their second round CIF-SS playoff contests Thursday night. Huntington Beach, ranked second in Division 1, defeated Rancho Cucamonga 3-2, while Edison swept Valencia High of Valencia 3-0. The Oilers will next face Poly High of Long Beach in the quarterfinals on Saturday. The Chargers will take on Mira Costa. In Division 7, Garden Grove bested Patriot 3-0, while in Division 8, Orangewood Academy fell 3-0 to Gladstone. The Argos’ next opponent will be Notre Dame High of Riverside. Bolsa Grande High School won the Garden Grove League girls’ cross country title Thursday at Mile Square Park in Fountain Valley. After the Matadors, the order of finish was La Quinta (second), Garden Grove (third), Los Amigos (fourth), Santiago (fifth) and Rancho Alamitos (sixth). The individual title was won by Karina Vergara of La Quinta with a time of 18:20.